In a reckless decision, the U.S. withdrew from the Iran nuclear agreement – signed back in July 2015 as the Joint Comprehensive Plan of Action – and reinstated all nuclear-related sanctions on Iran on May 8. Given the secondary nature of the sanctions, all companies trading with and investing in Iran are bound to wind down their contracts within 90 to 180 days. Trump has decided to please his voter base with the termination of the deal. He went on with his notorius ambition to deconstruct Obama’s legacy and gave in to his hawkish advisers. In addition, Israel and Saudi Arabia had lobbied hard with Trump to nix the deal. The U.S. abandoned an agreement that had worked well. Trump and the Iran hawks in his security cabinet had long vowed to nix a deal they considered flawed in at least four respects. First, Trump criticized the sunset clauses in the deal – the fact that Iran will be allowed to resume parts of its civil nuclear programme in 8 to 15 years (omitting the fact that the stringent controls on the programme by the inspectors of the IAEA will never expire). Second, Trump demanded full access of IAEA inspectors to Iranian military sites – which Iran has so far refused, but the inspectors had not asked for. Third, he asserted that a fixed deal needs to prohibit Iran from building and testing its missile arsenal. And, fourth, Iran’s alleged ‘malign activity’ in the Middle East should be stopped. The JCPOA had been an agreement to address the nuclear programme; even called upon Iran not to test ballistic missiles; but it was never designed to deal with the policies of Iran in the Middle Eastern region. Had western nations tried to adress the “malign and destabilizing activity” (Trump) of Iran in the region, no agreement could have been achieved at all. By withdrawing from the deal, the U.S. ditched efforts by its european allies to preserve the JCPOA and address unrelated issues in a separate agreement. France, Germany and the UK failed to keep the U.S. in the Deal. The U.S. decision is a blatant rebuff of vital security interests of its european allies and demonstrates the latter’s irrelevance to the U.S. even on vital security issues. 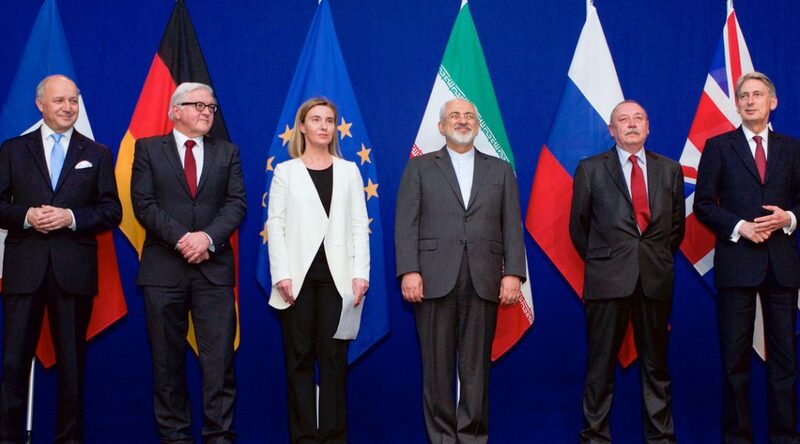 The EU-3 have not only failed to prevent the scuttling of the Iran Deal, they have contributed to undermine it by nurturing the U.S. narrative that the JCPOA misses to adress pertintent issues. So what’s next? Iran has declared to stay in the agreement, as have all other signatories. However, Iran has signed the JCPOA because it had expected significant financial and economic benefits after the end of the sanctions regime. Most of these expectations have not been met anyway. With the US sanctions reimposed and some additional sanctions added the already dire economic situation in Iran will further deteriorate. For sure, the question arises for Iran why it should continue to adhere to an agreement it doesn’t benefit from. If the US will indeed start to sanction EU companies (or Russian and Chinese companies for that matter) trading with and investing in Iran, the Europeans will bow to the US pressure. For most EU companies the US market is much more important and valuable than the Iranian market. At that point, Iran will defintely have no reason to respect the agreement any longer. Trump has scuttled the deal with no apparent alternative. If there is indeed a Plan B we could think of three more or less likely strategies: First, The U.S. reimposes all nuclear related sanctions plus new (secondary) sanctions to push Iran to renegotiate the whole deal. This would most likely be a time consuming option, in which Iran after years of crippling sanctions will finally have to give in and accept even tougher conditions than those imposed by the JCPOA. To be honest, Trump and his hawkish friends want to force Iran into submission, denying it a role as an independent regional power whose interests have to be recognized. Second, the Iran hawks in the Trump Administration like Pompeo and Bolton could push for a military solution. This scenario will become much more likely if Iran were to withdraw from the JCPOA as well and restart its nuclear programme. Third, the real goal of the Administration’s Iran policy is outright regime change in Iran. The cancellation of the JCPOA thus is just a first step to prepare for a much more ambitious effort. The sanctions are designed to bring about the collapse of the Iranian government. If this approach won’t work outright military aggression will be used. So either Trump is actually right that Iran can be pushed to further concessions and deterred from going nuclear by a harsh sanctions regime or the U.S. will see no alternative to war if Iran decided to push for a nuclear weapon after the total breakdown of the JCPOA. Or is it more likely, that the U.S. objective is not just the prevention of an Iranian nuclear bomb but outright regime change? Previous PostInterview für das Ö1 Mittagsjournal über die Rolle Österreichs in der Skripal-AffäreNext PostFriends. Iran will fight like hell. And Israel too. Its not a USA – matter. Its Netanyahus paranoia – or better information status. Plus the Israeli missiles on the sidelines, to provoke reactions from the Syrians – and the Iranians, (the actual target to be goaded to respond), could be just the overture to the grand plan for war- with everyone – the Americans, Israel and not to be missed, the Saudis, who also have a big stake in all this. Plus the Israeli missiles on the sidelines, to provoke reactions from the Syrians – and the Iranians, (the actual target to be goaded to respond), could be just the overture to the grand plan for war- with everyone – the Americans, Israel and not to be missed, the Saudis, who also have a big stake in all this, to go for it . . full force. What I miss in the discussion about the iranian nuclear Programm and the JCPOA is the fact that Iran does have, according to the non proliferation treaty, the right to use peaceful nuclear technology which includes uranium enrichment not limited to a certain degree and the right to establish a closed nuclear fuel cycle. From a legal point of view we are safe to conclude that Iran was never obliged to sign the JCPOA or to accept the conditions of that “treaty”. Of course Iran did hide parts of its nuclear programme but again from a legal point of view this behaviour did not result in treaty-breach (NPT) or a violation of its right to use nuclear technology peacefully. For the US the JCPOA was just an instrument of policy to oppress Iranian interests because neither the NPT nor the measures of the security council were able to deal with the Iranian uprising in the Middle East.